The Ramones Way: Street At Rockers' High School Is Renamed For Band : The Two-Way They're officially the coolest kids to come out of Forest Hills High in Queens, N.Y., and that's saying something. Other famous former students included Burt Bacharach, Paul Simon and Art Garfunkel. 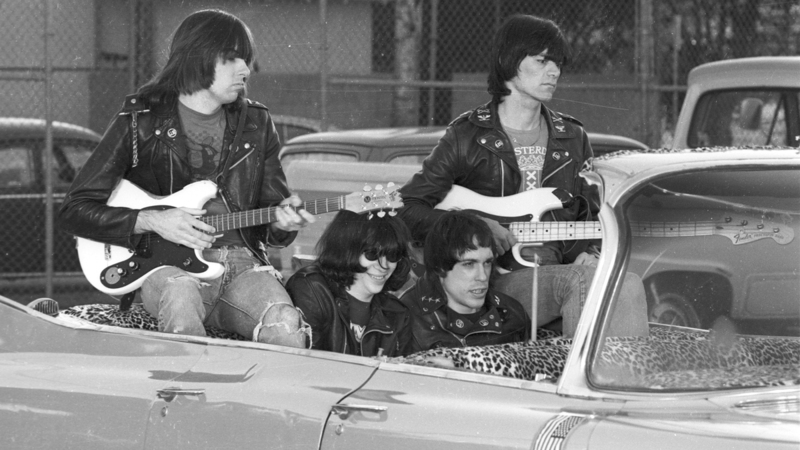 The Ramones, seen here in an undated photo, have been honored by having a second street in New York City renamed for them. They're officially the coolest kids to come out of Forest Hills High in Queens, N.Y., and that's saying something. The street where the Ramones — Joey, Johnny, Dee Dee and Tommy — went to high school is now named for them, as they beat out other former students such as Burt Bacharach, Paul Simon and Art Garfunkel. It's a natural fit for a band that personified street-tough punk rock to have a street named for it — and the band now has two in New York City alone. The new one's at 67th Ave. and 110th, where hundreds of fans gathered for a renaming ceremony Sunday. Already on the map: Joey Ramone Place on the Lower East Side, near the former home of the CBGB club. "Mickey Leigh, brother of the late Joey Ramone, led the effort to commemorate the band's origins. Although all of the Ramones' original members have passed on, among those in attendance today were the Ramones' former manager, Danny Fields, and the band's long-time tour manager, Monte Melnick. Melnick, also a Forest Hills High alumnus, says the band's legacy can be described as succinctly as their songs.
" 'They did what they could with what they had, which was their music. That's the Ramones way.'" To appreciate their feat of having their old high school's street named for them, consider that other former students included Bob Keeshan (who portrayed Captain Kangaroo), Radioactive Records founder and music promoter Gary Kurfirst, and current U.S. Treasury Secretary Jack Lew. Another famous product of the Forest Hills neighborhood was Peter Parker, a.k.a. Spiderman, whose Midtown High School is believed to have been based on Forest Hills High. In honor of Halloween, here's one of the Ramones' later hits: "Pet Sematary" — as in "I don't wanna be buried in a ...."